The close ties between science and imperialism were in fact just one part of a more complex relationship. The third crucial member of this relationship was capitalism, which financed both science and empire, and which led to an unprecedented growth in the world economy. How does a capitalist economy function? How is it different from traditional economies? Is capitalism natural, or is it really a kind of religion? In this lesson Dr Harari examined the rise of the capitalist economy and explained how it was closely connected with both modern science and European empires. This week continues the theme of “The Scientific Revolution“These are my notes from Dr Harari’s lectures. To create them I use the subtitles from his videos lectures presented by Coursera.org. Economics is often seen as a notoriously complicated subject. Understanding modern economic history and the rise of the capitalist system is actually quite easy. To understand it the key word is growth. The most unique and important characteristic of the modern capitalist economy, is that it is growing all the time. Every year, we produce more than last year, and we have more goods and money and so forth. In 1500, global production of goods and services in the entire world is estimated to have been equal to about $250 billion in today’s dollars. Today it hovers around the mark of $60 trillion. More importantly, in 1500, annual per capita production, the production of a single person on average, was $550 a year. Today, on average, every man, woman, and child on earth produces $8,800. To understand how the modern economy grows at such an astounding rate, let’s begin with a simple example. Mr Smith wants to open a new business, a new bakery. He doesn’t have the money so he goes to the bank and asks the bank for a loan. The bank has money because people put their earnings into the bank. A big contractor, who has just finished building an Italian restaurant, earned $1 million and put it in the bank. The bank now has $1 million. Mr Smith presents his business plan to the banker, explaining what he wants to do and how much money he will make. The banker is convinced and loans Mr Smith $1 million. Mr Smith hires the same big contractor to build the bakery. He pays the contractor $1 million dollars and the contractor deposits this money into his bank account. The contractor now has $2 million in his bank account, the $1 million from the Italian restaurant and the $1 million from Mr Smith for the bakery. In the bank there is only $1 million, because the previous million dollars the bank loaned to Mr Smith and this is the million dollars that he gave to the contractor. To make it more complicated. Two months after beginning to build the bakery, the contractor tells Mr Smith that there are unforeseen problems and expenses. The cost of building the bakery is not $1 million; it’s now $2 million. Mr Smith goes back to the bank and explains what happened. Luckily the bank has confidence in him and gives him another million which he transfers to the contractor. The contractor now has $3 million in his account. In the bank there is still just $1 million, the same million dollars that’s been there all along. According to current US banking law, the bank can repeat this exercise seven more times. It can loan Mr Smith $1 million another seven times, so that eventually the contractor would have $10 million in his account and the bank would have only $1 million in its safe. Today’s banking laws allow banks to loan $10 for every dollar that they possess. Where the other $9 comes from is what we’ll try to understand, in this lesson. It is important to understand that more than 90% of the money in all the bank accounts today in the world is not covered by anything, there is nothing there. If all the account holders at your bank wanted the money in their account at the same time the bank would immediately collapse, because a bank doesn’t have all the, all the money. The same is true of Barclays, Deutsche Bank, Citibank, Lloyds, and all the other banks in the world. None of them have in their possession, the money that appears in the bank accounts. This may sound like a giant fraud, but if this is fraud, then the entire modern capitalist economy is a fraud. Some people say it is, but it’s been working in amazing way for hundreds of years. It’s not a deception, but it’s a tribute to the amazing abilities of the human imagination. What enables banks and the entire capitalist economy to survive and to flourish is our trust in the future. In the above example of the bakery, the gap between the account statement of the contractor, which says $3 million, and the money actually in the bank, which is just $1 million, what covers, the gap, is the future bakery. The bank loaned the missing money, trusting that one day the bakery would be built and would be profitable. The bakery hasn’t baked a single loaf of bread or a single cake yet. Mr Smith and the banker believe that a year from now the bakery will be selling thousands of loaves and cakes and cookies and will make a lot of money. In this imagined future, Mr Smith will be able to repay the loan along with the interest. The bank will then be able to give the contractor all the money in his account if he demands it. The entire economy is thus based on our trust in an imaginary future. The trust that you and everybody else has, and the trust the banker has in the bakery that may exist in 1 year, along with the trust that the contractor has in his bank. He trusted that in the future the bank would give him back his money plus interests. This is how the capitalist economy functions, by trusting the future. This is why it grows so rapidly. The secret, the magic of capitalism, is that it finances present expenses with make believe money that has no cover in the present and may only may have cover in the future. For most of history, the economy was frozen. It hardly grew at all. It was very hard to finance new enterprises because people did not trust in the future. In the Middle Ages, before the rise of the capitalist system, in order to build a bakery, you would need to pay a builder, buy an oven, and pots, and pans, and knives, and spoons, and everything else needed for a bakery. Once the bakery opened then it would earn a lot of money, but you couldn’t build the bakery in the first place if you didn’t have money. This was the trap that froze the human economy for centuries and for millennium. Without a bakery, you can’t bake cakes. Without cakes, you can’t make money. 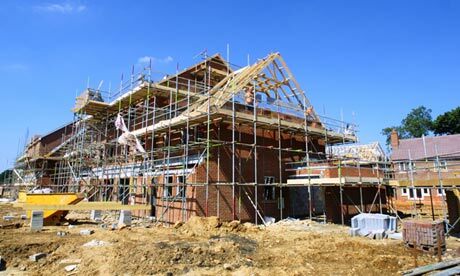 Without money, you can’t pay the builder, and without the builder, there is no bakery. Humankind was trapped in this vicious circle for thousands of years and this meant that economic growth was very slow and very limited. It was very hard to start new businesses or to expand existing businesses. The way out of the trap was discovered in the Modern Era with the appearance of a new system, the capitalist system which is based on credit. In a capitalist system people agree to represent imaginary goods, goods that don’t exist at all in the present, with a special kind of money which we call credit. In a capitalist system, if you want to open a new bakery and you don’t have any money, you go to the bank and you ask the bank to give you credit. If you convince the bank that your plan is sound, the bank will give you this credit and will loan you some money. When you eventually start making money from this bakery, then you can repay the loan to the bank plus some interest. This is the way in which credit enables us today to build the present at the expense of the future, and this is what enables the economy to grow so fast. Credit is based on trust in the future and money in general is based on trust. Before the modern age money was based on the trust in things that exist. People would trust the power of the king and therefore his coins for example. 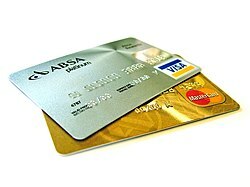 Credit is much more sophisticated than just any kind of money. Credit is money which is based on trust in the future, in things that don’t exist at all anywhere in the present, but may exist someday in the future. People have been loaning money to one another for thousands of years. We have written evidence of loans from Ancient Sumer, 5000 years ago. The problem in previous era was not that nobody could imagine what credit is, the problem was that people did not want to extend much credit, because they didn’t trust that the future would be better than the present. As we saw in the lesson about the scientific revolution, people in traditional societies did not believe in progress. They tended to assume that things were better in the past, and that the future will be worse than today, or at best, it will be just like the present. In economic terms people believed that the total amount of wealth in the world was limited or stable if not dwindling. People therefore considered it a bad bet to assume that they personally, or their kingdom, or the entire world would be producing more wealth 10 years from now. One city might flourish, but only if another city became poor, impoverished. The idea was that the economic pie of the world is of a given size and you could cut this economic pie in many different ways, but it never got any bigger. That’s why many cultures concluded that making a lot of money and being rich was sinful, was bad. Jesus, in the New Testament said that it is easier for a camel to pass through the eye of needle than for a rich man to enter into the kingdom of God. Many people still don’t really understand how capitalism works and they still think that the economic pie is static. If it stays the same size, then you cannot really enrich yourself except by robbing other people. This also means that there is little reason to extend much credit to people. Credit is actually the difference between the size of the economic pie today, and the size of the economic pie tomorrow. If the pie stays the same, why extend credit? Why assume that whoever you loan the money to would be able to repay you if the economy doesn’t grow? This is why in the pre-modern, pre-capitalist world it was very hard to get loans. Loans were usually small, short-termed and subject to high interest rates. This made it very difficult to start new enterprises. Because there were very few new businesses, the economy indeed did not grow and so the economy did not grow. The trust in the future remained small, and people didn’t want to extend much credit. This is how the expectation of stagnation fulfilled itself, because people did not believe that the economy would grow, it didn’t grow. The scientific revolution and the idea of progress broke the circle. The idea of progress is built on the notion that if we admit our ignorance and invest resources in research things can actually improve. This idea was soon translated into economic terms. 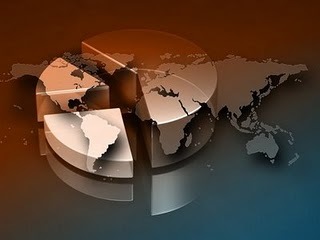 Whoever believes in progress, geographical discoveries, technological inventions and organizational developments can increase the sum total of human production, human trade and human wealth. If you really believe in progress you believe that the entire economic pie can grow. Then everybody can enjoy more food, more clothes, more wealth, at the same time. The fact that one person becomes richer is not at the expense of somebody else. Over the last 500 years, the idea of progress convinced people to put more and more trust in the future. This trust created credit and credit brought real economic growth through new businesses. Growth strengthens the trust in the future and opens the way for giving even more credit. It didn’t happen overnight and there were many economic crises on the way, but over the long run, the general direction was unmistakable. Today, there is so much trust in the future, and there is so much credit in the world that governments, business corporations and private individuals can obtain, large, long term and low interest loans quite easily. You can get millions from the banks that you have to repay in 20 or 30 years, for an interest of just 2% or 3% a year. It’s nothing compared to what was demanded from people in history. The rising belief in progress and credit also led to dramatic ethical and political revolutions. 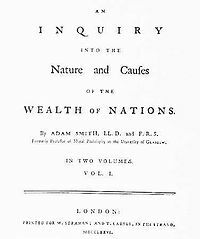 In 1776, the Scottish economist, Adam Smith, published the book “The Wealth of Nations”, which is probably the most important economics book of all times. In his book, Adam Smith made the following revolutionary argument. Smith said that when a shoemaker has greater profits than he needs to maintain his own family, he will tend to use his profits to employ more assistants, in order to further increase his profits. 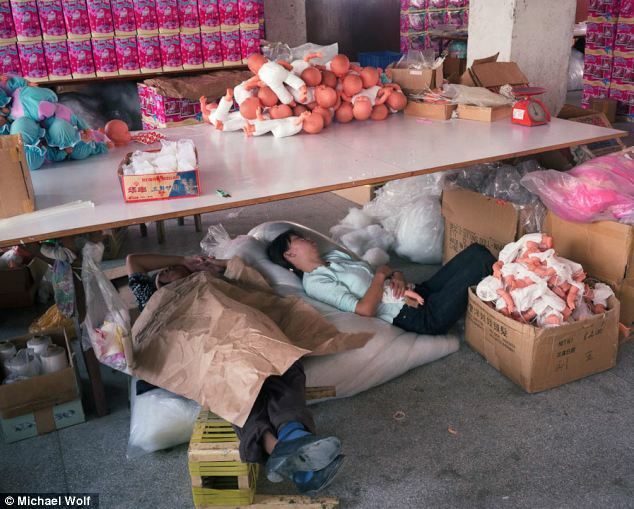 The more profit the shoemaker has the more assistants and more employees he can employ. It follows that an increase in the profits of private entrepreneurs is the basis for the increase in collective wealth and prosperity. This may not strike you as a very original idea, because we all live in a capitalist world that takes the arguments of Adam Smith for granted. We hear variations on this idea every day in the news. 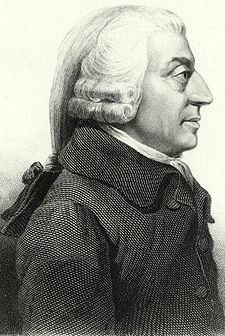 However, Adam Smith’s claim that the selfish human urge to increase private profits is the basis for the collective wealth and welfare of society has been one of the most revolutionary ideas in human history. It was revolutionary, not just from an economic perspective, but from a moral and political perspective. What Adam Smith said is, that greed is good and that by becoming richer you benefit everybody, not just yourself. He is saying that egoism is altruism. When you’re being egoist and pursuing your own wish to make more and more money, you’re actually being altruistic and helping all the people around you. Smith taught people to think about the economy, not as a zero sum game, but as a win, win situation. Smith thus, denied the traditional contradiction between wealth and morality. If Jesus said, that a rich man cannot enter the kingdom of God, Smith said, that the rich men are the best people in society. They are the ones creating the kingdom of God, here on Earth and benefiting everybody. According to capitalism and to Adam Smith, being rich means being a good person. People become rich, not by robbing their neighbours, but by increasing the overall size of the pie. The rich are, accordingly, the most useful and most benevolent people in society, because they are the ones who turn the wheels of growth for the advantage of everybody else. However, this works, only, if the rich actually use their profits, to open new factories and to hire new employees and not waste it on non-productive activities. Consequently, a very crucial part of the modern capitalist economy was the emergence of a new ethical code, a code of how people should behave. According to this code, profits must be reinvested in production which brings profits and profits then, must be reinvested in production and so forth. Investments can be made in many ways. You can open a new factory, enlarge an existing factory, and conduct scientific research, which will lead to new products or even explore new markets. All these investments must somehow increase production and translate into larger profits in the future. In the new religion of capitalism, the first and most sacred commandment is that the profits of production must always be reinvested in increasing production. Capitalism distinguishes between Capital and wealth. 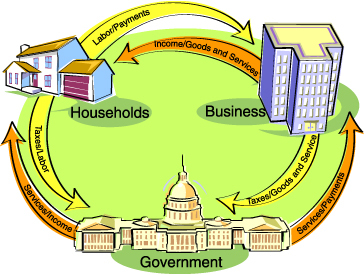 Capital means money, goods and resources that are invested in production. Wealth, on the other hand, is something that is wasted on unproductive activities or just buried in the ground. A Pharaoh in ancient Egypt, who pulls resources into building a pyramid, for example, is not productive, it doesn’t produce anything, and he is not a capitalist. Pharaohs in ancient Egypt were not capitalists they were very wealthy people, but not capitalists. 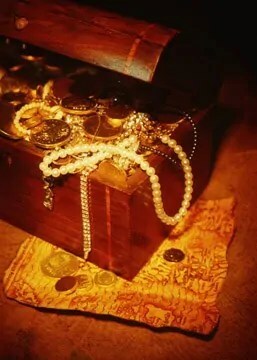 A pirate who loots a treasure chest full of gold coins and buries it on a beach in the Caribbean is wealthy, but not a capitalist, because he didn’t invest his money in anything productive. On the other hand, a hard working factory hand, who takes some of his monthly salary and invests it in the stock market, is a capitalist. He treats his money as capital that is reinvested in production. He’s not a big capitalist, because he has only a little money, but is still thinking along capitalist lines. This idea, that the profits of production must be reinvested in increasing production may sound quite trivial to you because this is how our world functions. It was a very strange and alien idea to most people throughout history. In pre-modern times, people believed that production was more or less constant so there was no reason to reinvest your profits in production. This was why the elite in the middle ages, the nobility did not believe in the Capitalist ethic of investment. They believed in ethic of generosity and conspicuous consumption. They had money, so they spent it on tournaments, on banquets, on palaces, on walls, on charities, on building churches. Very few noblemen in medieval Europe tried to reinvest their profits, in increasing the productivity of their estates. In the modern era the nobility was gradually replaced by new elite, whose members are true believers in the religion of Capitalism. The new Capitalist elite are made up, not of dukes and kings and queens and princes, but of managers, stock traders, industrialists and people of the middle class. These people are far richer than the medieval nobility but are far less interested in extravagant consumption. They spend a much smaller part of their income on non-productive activities. You just need to look at them, to realize the difference. 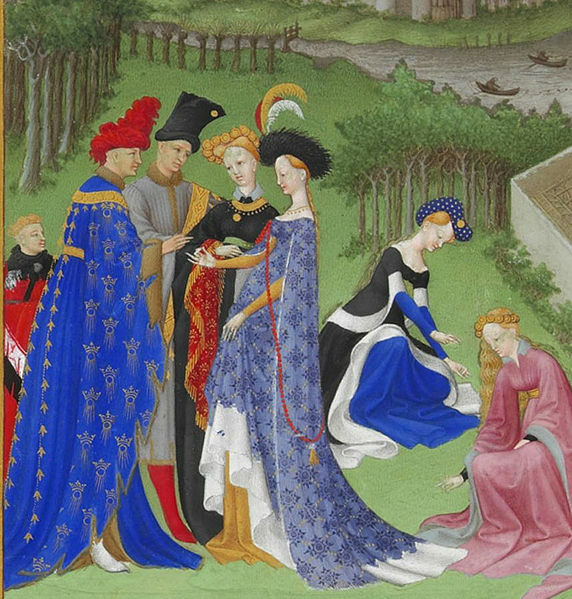 Medieval noblemen wore very colourful robes of gold, silver, silk and fur and so forth. They devoted, much of their time to banquets, carnivals, and tournaments. In comparison the elite of our days wear dreary uniforms, which we call suits. They have very little time for carnivals and banquets. Most rich people today, the millionaires and multi-millionaires, spend their days rushing from one business meeting to another trying to figure out where the best place to invest their capital is, and trying to find out what happened to the previous investments. It’s not just multi-millionaires who invest their income in the hope of increasing productivity. Ordinary people, in government, also think along very similar lines. In many quite modest neighbourhoods, people spend a lot of their dinner talk discussing where to invest money. Even those who don’t have much money, but spend time thinking of where to put it, in a flat, in real estate, in a stock exchange, in a start-up, are thinking along capitalist lines. Medieval nobility rarely argued and discussed where to invest their money. Governments try to find where to invest their tax revenues in the best way, in productive enterprises that will increase the future income of the government. One government may decide to invest in infrastructure building a new port, in order to make it easier for factories to export their products. The government hopes that they will be able to tax these factories and get more money which, they will be able to invest even further in infrastructure. Another government may think that education is a better investment than infrastructure. They, invest a lot of money, in giving citizens very good education based on the assumption that educated citizens will develop high tech industries, which pay lots of taxes without needing extensive infrastructure, like ports. Today, capitalism is no longer just a way to manage the economy, and invest money. It has turned into a religion. It now includes a set of teaching about how people should behave, educate their children, and even think. The principle maxim, of the capitalist religion, is that economic growth is the supreme good, because everything in the world depends on economic growth. Even if you want justice or freedom or happiness, you can have them, only if there is economic growth. Ask a capitalist, how to bring justice or political freedom to a place like Zimbabwe or Afghanistan. You’re likely to get a lecture, on how economic growth and a thriving middle class are essential for having stable democratic institutions and about the need to educate Afghan tribesman to appreciate the capitalist values of free enterprise, hard work and self-reliance. This new capitalist religion has had a decisive influence on the development of modern science. Scientific research is usually funded by either governments, or private businesses. When capitalist governments and businesses consider whether to invest money in a particular scientific project the first question they usually ask is, whether this project will enable us to increase production and profits, whether it will encourage economic growth or not. A project that does not contribute anything to economic growth has very little chance of finding a sponsor. Any history of modern science, that leaves capitalism out of the picture, is giving only half the picture. You won’t understand the history of science if you don’t take capitalism into account. Conversely, the history of capitalism is unintelligible unless you take science into account, because capitalism is founded on a belief in perpetual economic growth, that the pie will get bigger. This belief flies in the face of almost everything we know about the universe. A society of wolves would be extremely foolish to believe that a supply of sheep would keep on growing indefinitely. The human economy, in the last 500 years, nevertheless, managed to really grow without limits, exponentially, thanks to scientists coming up with new discoveries and new gadgets every few years, discoveries, such as the continent of America, the internal combustion engine, and genetically engineered sheep. Banks and governments print the money, but ultimately, it is the scientists who have to foot the bill. 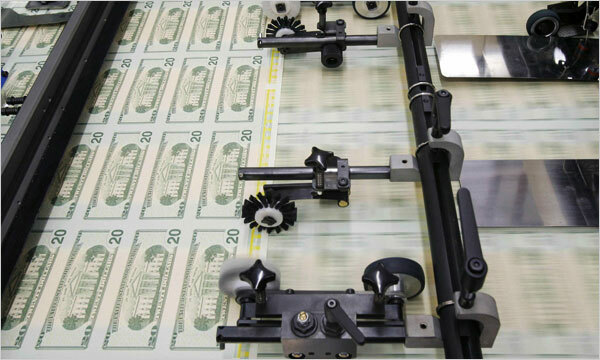 Over the last few years, since 2008, and the beginning of the last economic crisis, governments and banks, all over the world, have been printing money like mad. Well, they haven’t actually printed money they just go to a digital file saying $1 trillion and change it to $3 trillion. $2 new trillion appear, and can start circulating in the economy. Over the last few years government and banks have been creating terrific amounts of more money, and more credit, because everybody is terrified that economic crisis that began in 2008, will stop the growth of the economy and will cause the collapse of the entire system. If the system doesn’t grow, it collapses, it doesn’t stand still. This is why trillions of new dollars, euros, and yens, have been created, to give more credit and boost economic growth. What allows the governments and the banks to create all this new money is our trust in them. This trust is eroded; there is a limit to how many new dollars the U.S. government can create without eroding the trust of people, not only in the United States, but all over the world. Ultimately, what really gives cover to all this new money is our trust in science. The only thing that can cover these trillions of dollars and save the economy from collapse is new scientific discoveries. Everybody hopes that all the researchers that are being financed by new money. in fields like biotechnology, and nanotechnology will lead to new technological inventions and sol create new businesses and new products. The profits from all these new businesses and products is what will cover the trillions of dollars that government and banks have created over the last five years. If that doesn’t happen, we’re facing collapse, because most of the money in the world, more than 90% of it, doesn’t exist anywhere, it is based on our hopes for the future. If these hopes are not realized, it doesn’t mean that we stay with what we have now, it means that more than 90% of the money, we think we have now, will just disappear. All the money in the bank accounts, and in the pension funds, and in insurances, and so forth, if there is no growth, it won’t stay there, it will simply disappear. This will cause collapse of the entire system. This is why capitalism has such close links with science. Credit and capitalism were not unique European inventions. In early modern China, India, and the Muslim world were quite a few merchants and bankers who also thought along capitalist lines. However, the kings and generals in the palaces and forts of Asia tended to despise merchants and their mercantile way of thinking. Most non-European empires of the early modern era financed their wars and activities by taxing their subjects and plundering the enemy and owed little to credit systems. They cared little about the interests of bankers and investors. In Europe, on the other hand, kings and generals, generally and gradually adopted the capitalist way of thinking until, kings and generals moved aside and merchants and bankers became the ruling elite in politics as well as economics. The European conquest of the world was increasingly financed through credit, and not through taxation, and it was increasingly directed by capitalists, whose main ambition was to receive maximum returns on their investments. The empires built by bankers and investors managed to defeat the empires built by kings and nobleman, because they had a much stronger financial base. It’s better and easier to finance an empire from investments than from taxation. Nobody wants to pay taxes, but everybody is very happy to invest. England, France, Spain and the Netherlands were much poorer and smaller countries than China, India or the Ottoman Empire, but they financed the conquest of empire, not with taxation, like the Chinese, but with credit. European conquerors took loans from banks and from investors, in order to buy ships, cannons, and to pay soldiers. They used these ships and soldiers and cannons to explore the world, and conquer new colonies. Profits from the new trade routes, and from the new colonies, enabled them to repay the loans, and thereby, build trust and receive more credit next time. Thanks to this trust, the credit that Europeans could gain just grew more and more over the centuries, and this fuelled the growth of empires. Another major difference between the European empires and the Chinese or Ottoman Empires were that the European empires were created and run not by states and governments. To a very large extent, empires like the English, French, or Dutch empires were created and managed by private businesses, or, more accurately, by limited liability companies. The early modern age was the era in which the limited liability company rose to power and became a central player in history. Exploring unfamiliar oceans and conquering new colonies was a very risky affair so few people wanted to take a personal risk. So the Europeans created limited liability companies, and spread the risk of building empire between many investors. If you wanted to explore the Pacific Ocean or to conquer a new colony in America, what you did is to set up a company. The company then sold shares in the stock exchange to investors and collected money from a large number of investors, each of whom risked only a small portion of his capital. 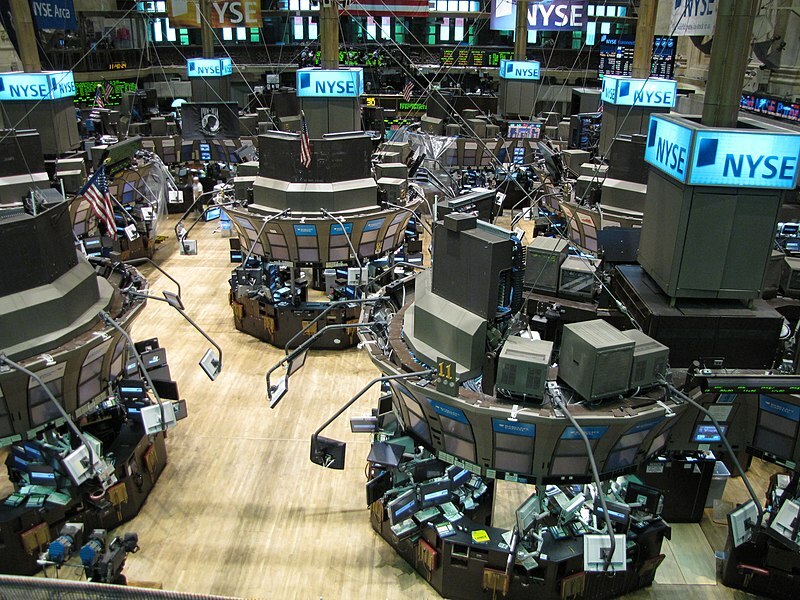 The stock exchange could finance campaigns of exploration and conquest far more easily and efficiently than any kingdom or empire that taxed its subjects. This was how, even very small European nations, like England or the Netherlands could build giant empires, much bigger than the Ottoman or the Chinese empire. The Dutch empire, for example, was built not by the Dutch state, but by Dutch private companies. The most famous Dutch company was called in Dutch, the Vereenigde Oost-Indische Compagnie or for short VOC, established in 1602. 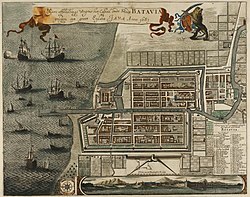 VOC got money by selling shares in the Amsterdam Stock Exchange and used the money to build ships and send them to Asia and bring back Chinese, Indian, and Indonesian goods, and sell them in Europe. Later VOC began using the money to finance military actions against competitors and against pirates which threatened the trade routes. Eventually, VOC money financed the military conquest, of Indonesia. Indonesia is the largest archipelago of islands in the world. It has thousands upon thousands of islands, which in the early 17th century were ruled by hundreds of different kingdoms, and principalities, and Sultanates, and tribes. When VOC merchants from the Netherlands first arrived in Indonesia in 1603, their aims were at first just commercial. However, in order to secure their commercial interests and to maximize the profits of the shareholders, VOC merchants began to fight wars against local rulers who charged too much money in tariffs as well as to fight against pirates and competitors. VOC armed its merchant ships with cannons; it recruited European, Japanese, Indian, and Indonesian mercenaries. It built forts and conducted full scale battles, sieges and campaigns. 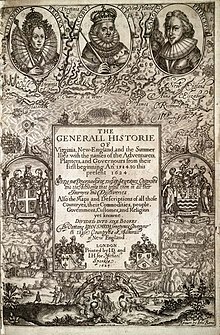 In the early modern period in the seventeenth century, it was acceptable for a private company to have armies and wage private wars. VOC, over the years, conquered island after island until eventually it conquered almost the whole of Indonesia, and it ruled Indonesia, a private company, ruled Indonesia with millions of people, for close to 200 years. Only in 1800 did the Dutch state assume control of Indonesia and made it a national colony of the Dutch state, not a colony of a private company. Today, some people warn that corporations are accumulating too much power. Early modern history shows just how far that can go. Businesses back then could actually have armies and fight wars and build empires. While VOC was operating in the Indian Ocean, another famous Dutch company, the Dutch West Indies Company, was operating in the Atlantic Ocean. In order to control trade on the important Hudson River, in North America, this Dutch company built a settlement on the entry of the Hudson River and it called it, New Amsterdam. The colony, New Amsterdam, was threatened by Indians and was repeatedly attacked by the commercial rivals of the Dutch, the British. Eventually in 1664, the British managed to capture New Amsterdam. They changed its name from New Amsterdam to New York. The remains of the war that a Dutch company built to defend its colony against the British and the Indians, are today paved over by the most famous street in the world, it’s called Wall Street, after the wall that defended this colony of the Dutch company against its enemies. The British also built their empire largely with the help of private companies that raised money on the London Stock Exchange. The first British settlements in North America were established in the early 17th century by companies such as, the London Company, the Plymouth Company, the Dorchester Company, and the Massachusetts Company. Not by the state. 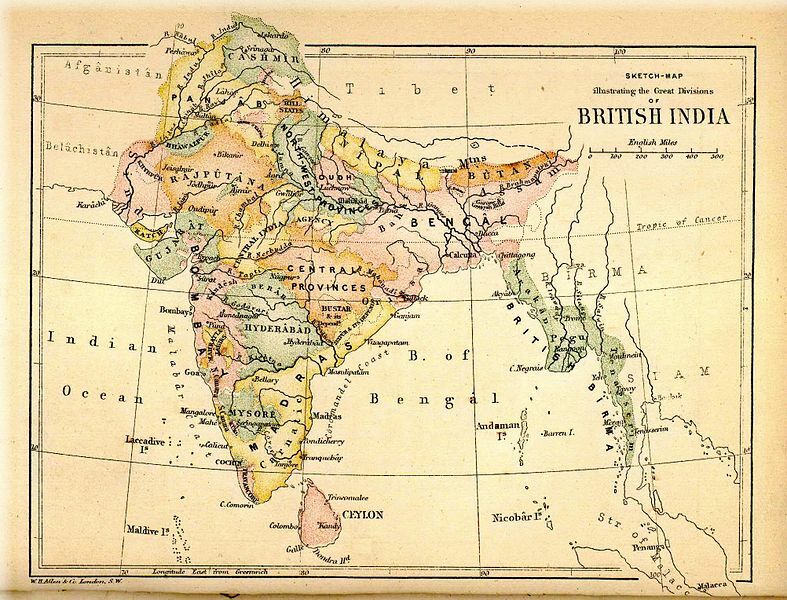 Even the British conquest of India was in fact the work of a private company, not the work of the British state. This company was the famous British East India Company. From its headquarters in Leadenhall Street in London, the British East India Company ruled a giant Indian empire for about a century. It maintained a huge military force of about 350,000 soldiers. The army of this company was much bigger than the British state army. 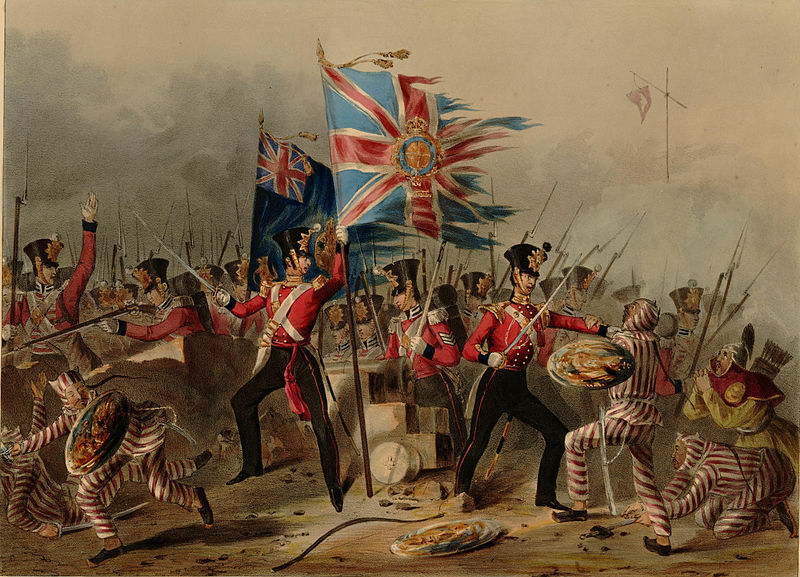 Only in 1858 did the British crown nationalize India along with the company’s private army, and made India and the Indian army a possession of the British crown. The nationalization of Indonesia by the Dutch state in 1800 and of India by the British crown hardly ended the close relationship between capitalism and empire. On the contrary, in the 19th century, the link between capitalism and the European empires grew even stronger. Private companies no longer needed to establish and govern private colonies, and could allow the government to nationalize these colonies, because in the 19th century the managers and the stockholders of the companies controlled the governments in London, Amsterdam and Paris. Once they controlled the state they could allow the state to do the hard work for them. Karl Marx famously said that western governments, at least in the 19th Century, were actually the trade unions of the capitalists. Just as shoemakers have a trade union of shoemakers, or dock workers have a trade union of dock workers, so capitalists also had a trade union, the government. The government looked after the interests of the big capitalists. 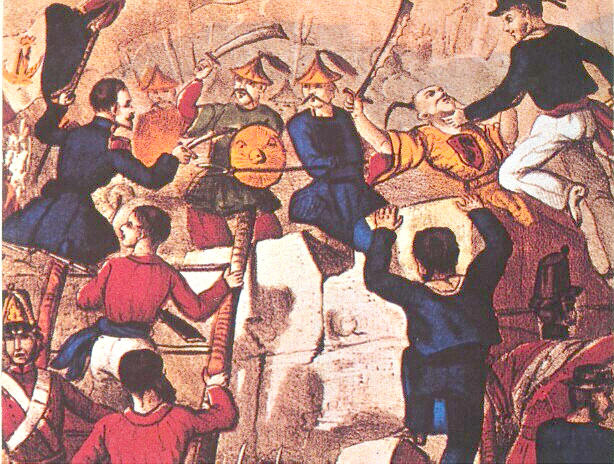 The most notorious example of how 19th century governments were controlled by capitalists and looked after their interests is the famous Opium War fought between Britain and China in the early 1840s. In the first half of the 19th century, the British East India Company and other in British business people, made huge fortunes by exporting drugs, particularly opium, to China. During this period millions of Chinese became opium addicts, and this harmed the country both economically and socially. In the 1830s the Chinese government made drug trafficking illegal. However, the British drug merchants, like the British East India Company, simply ignored the Chinese law and continued to export opium, and other drugs to China. The Chinese authorities didn’t like it, and began to confiscate and destroy the drug cargos. The drug cartels had very close connections in the British government. Many members of parliament and many cabinet ministers in London held stocks in the drug companies, or were managers of the drug companies like the British East India Company. They pressured the government to take action against the Chinese. In 1840, Britain declared war on China in the name of free trade. The British argued that the Chinese were interrupting the free trade of the drug dealers. They declared war on China in order to safeguard free trade, and they invaded China. The British won a very easy and decisive victory over the Chinese. The Chinese were extremely confident of themselves, but they had no answer to the new miracle British weapons. The British, in the middle of the 19th century, had heavy artillery, steamboats, rockets, rapid firing rifles and the Chinese had no answer to them and they were defeated completely. In the peace treaty that ended the Opium War, China agreed not to constrain the activities of British drug merchants, and also to compensate the drug dealers for the damages that were inflicted prior to the war by the Chinese police. The British also demanded, and received, control of the port of Hong Kong, which they then used as a secure base from which to sell opium and other stuff, in China. In the late 19th century, it is estimated that about 14 million Chinese, 10% of the population were opium addicts. Today this link between capitalists, credit, politics and government is still very close. We see that the success of a country today in the world depends much more on its credit rating than on its natural resources. Credit ratings indicate the probability that a country will pay its debts. In addition to purely economic data, when you calculate the credit rate of a country, you also take into consideration the political situation, cultural factors, social factors, and so forth. A country which is rich in oil, but has a despotic government and suffers from a lot of crime, and a corrupt judicial system, will usually receive a very low credit rating. Because it has a low credit rating, it will be hard for this country to borrow money and if it borrows money, the interest will be high. 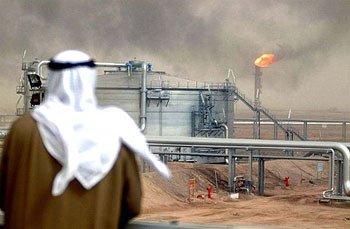 As it can’t borrow money easily, it will be difficult for this country to develop its oil fields, and it will probably remain a poor country, even though it is rich in resources, because it has poor credit ratings, and cannot borrow money, it will remain poor. On the other hand, a country which has no natural resources, but has peace, a good judicial system, and a free government, is likely to receive high credit ratings. This means that it will be able to borrow money cheaply which can be used to develop a good education system and develop a flourishing high tech industry, for example. By having good credit ratings, a country poor in resources, can become rich and prosperous. Many of the richest countries in the world don’t have many natural resources. Since capital and politics influence each other to such an extent, how the relations should be is a matter for very heated debate both among economists, and also among politicians and general public. One of the main issues today in politics is, how exactly to manage the relations between the political system and the capitalist system of credits, banks, and the stock exchange, and so forth. People who are called capitalists usually tend to think that capital should be free to influence politics but not vice versa. Politics should not interfere in the world of banks, capital and credit and so forth. Such people who believe in freedom of the markets, usually argue, that when you allow political interests to influence the economy too much, the result is unwise economic decisions and slower economic growth. For example, governments tend to impose heavy taxation on industrialists and capitalists, and use the money to give unemployment benefits to the poor. This is very popular with the voters, but, in view of many business people who believe in free markets, it would have been much better if the government kept taxes low, and left the money with the industrialists. Then the industrialists could use this money to open new factories and hire the unemployed, which is much better than giving them unemployment benefits. In this view, the wisest economic policy is to keep politics out of the economy, to reduce taxation and government regulation to a minimum and simply to allow the forces of the free market to take their course. It is argued that private investors when they’re not influenced by political considerations will always know to invest their money where they can get the most profit. This ensures the fastest economic growth possible which will benefit everybody, the investors, rich people, but also the workers and the government, and even the unemployed. Believers in capitalism and free markets tend to advise governments to do as little as possible, and let the markets make the wisest decisions by themselves. This doctrine of the freedom of markets as a top value is today the most common and most important variant of the capitalist religion. The most enthusiastic advocates of the free markets criticize almost everything governments do, whether it’s wars outside or welfare programs at home. They always tell government that they must simply do as little as possible, and the markets will take care of the rest. This view of the economy suffers from several very serious problems, and when taken to extreme, it has caused over the last few centuries, terrible calamities. This line of thinking is often called the belief in free markets, that markets should be free from politics. The logic is that the markets know far better than governments where best to invest the money. In its extreme form, the belief in the free market is as naive as the belief in Santa Claus. 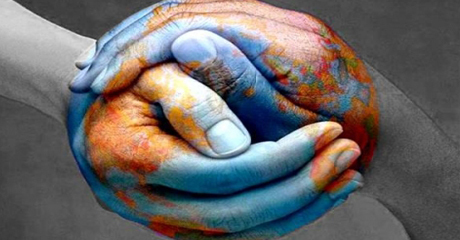 There simply is no such thing as a market completely free from politics and political intervention, because the most important economic resource is trust in the future. This resource is constantly threatened by thieves and charlatans. Markets by themselves offer no protection against fraud, theft and violence. It is the job of the political system to ensure continuing trust by regulating the markets and by punishing people who break or violate these regulations. When governments fail to do their jobs and to regulate markets properly, it leads to loss of trust in the market, dwindling credit and economic depression. There is however, an even more fundamental reason why it is dangerous to give markets completely free reign. If markets are not regulated, there is a very real danger that the powerful players in the market will exploit and oppress the less powerful in the pursuit of profits. For example, the owner of the shoe factory may try to increase his profits by paying his workers less while increasing the work hours. The standard capitalist answer to this criticism is that a really free market would protect the workers, would protect even the weak. If, a greedy factory owner pays too little to his workers and demands too much from them the best workers would naturally abandon him and go work for somebody else, for his competitor. The tyrant boss would find himself left with the worst workers or with no workers at all. He would have to improve the conditions he offers to the worker or go out of business. This sounds very good in theory, but in practice it doesn’t always work. In a completely free unsupervised market greedy factory owners can establish monopolies or cooperate with all the factory owners against the work force. If there is a monopoly controlling all the shoe factories in a country or if all the owners conspired together to reduce wages simultaneously then the workers are no longer able to protect themselves by switching jobs. Even worse, greedy bosses might use their power to turn their workers into slaves. At the end of the middle ages slavery was almost unknown in Christian Europe. During the early modern period, the rise of European capitalism went and hand in hand with the rise of the Atlantic slave trade. Unrestrained market forces and not tyrannical kings or racist ideologies were responsible for slavery in European colonies. When the Europeans conquered America, they opened their gold and silver mines and established sugar, tobacco and cotton plantations. These mines and plantations became the mainstay, the centre of American production and export. In order to work the mines and plantations, the owners started to import slaves from Africa. 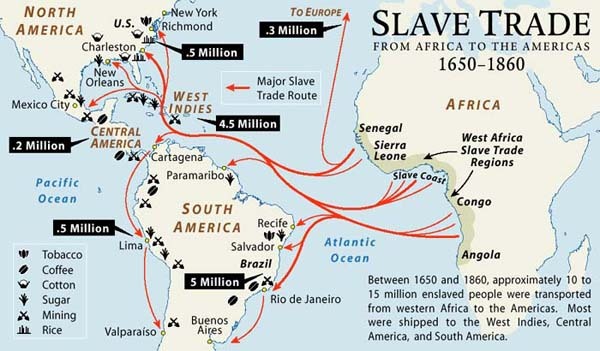 From the 16th to the 19th century, about ten million African slaves were imported to America. Labour conditions were horrible. Most slaves died in agony, and millions more died during the wars waged in Africa to capture slaves and during the long voyage from inner Africa to the shores of America. This whole enterprise, the slave trade, was not controlled by any state or any government. It was a purely economic enterprise organized, managed and financed by the free market, according to the laws of supply and demand. Privately-owned slave trading companies sold shares on the stock exchanges of Europe in London, Amsterdam and Paris. Middle-class Europeans, looking for a good investment, bought shares in the slaving companies. Relying on this money, the companies bought ships, hired sailors and soldiers and went to Africa. They bought slaves and transported them to America. People invested money in the slave companies, simply because it was good business. 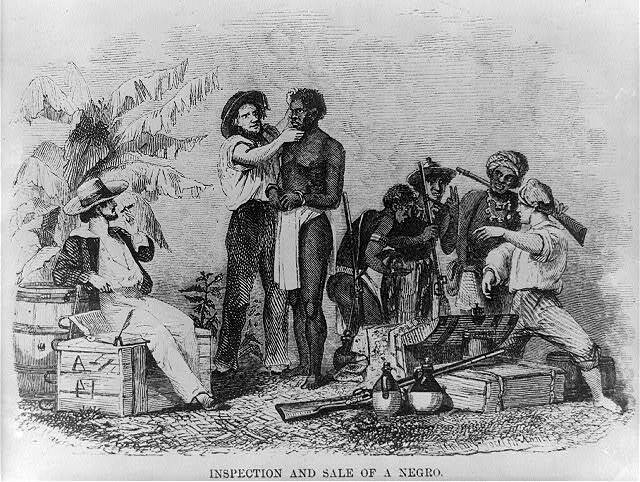 In the 18th century profits from investing in shares of slave trading companies was about 6% each year. This is extremely profitable as any modern consultant would be quick to admit. Today people are happy to receive 3 or 4% interest on their investment in year. This is the real problem of a completely free market capitalist system. It cannot ensure that profits are gained in a fair way. On the contrary, the craving to increase profits and production blinds people to anything that might stand in the way. When growth becomes the supreme good, and it is unrestricted by any other ethical or political consideration, the pursuit of growth can lead easily to catastrophe. Some religions in history, such as Christianity or Nazism killed millions of people out of hatred. Capitalism also killed millions of people, but not because of hatred. It killed millions of people out of indifference. The Atlantic slave trade did not result from racism, from hatred towards Africans. The individual who bought the shares, the broker and the stock exchanges that sold the shares of the slaving company and the managers of the slaving companies rarely thought about Africans at all. They were only interested in shares and money. Similarly, the owners of the sugar, cotton and tobacco plantations in America didn’t hate Africans. Many of them lived far away from the plantation and the only thing that they wanted to know about what was happening on the plantation was how much money they made at the end of the year. Nothing else interested them. It is important to remember that the Atlantic slave trade was perhaps the biggest crime of capitalism, but it wasn’t a single aberration in an otherwise perfect record. There are many other similar examples. In the case of the Great Bengal Famine, the British East India Company cared much more about its profits than about the lives of 10 million Bengalis. This is what led to the catastrophe. Countless other crimes accompanied the growth of the modern economy in other parts of the planet. The end result is that although the economic pie kept growing and growing and growing, profits were distributed in such an uneven way that many African peasants and Indonesian and Chinese labourers return home, even today, after a very hard working day in the factory or the field with less food and less money than their ancestors 500 years ago, even though the economy as a whole grew exponentially over those five centuries. Much like the agricultural revolution the growth of the modern economy might turn out to be a colossal fraud. The human species and the global economy as a whole may well keep growing and growing, but many individuals still live in hunger and in very difficult conditions. This is a very common criticism directed against the capitalist system. Capitalists have two main answers to this criticism. First of all, it is argued that capitalism has created a world which nobody but capitalists is capable of running. 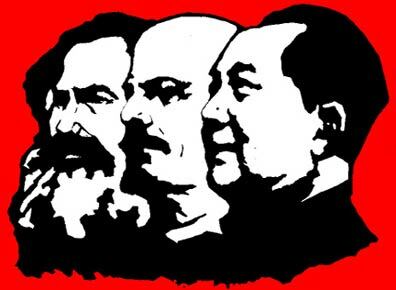 The only serious attempt to manage the world differently, communism, was so much worse in almost every considerable way from capitalism, that nobody really wants to try something different again. In the year 8,000 BC, you could bitterly regret the agricultural revolution, but it was too late to give up agriculture. Similarly, today, we may not like capitalism very much, but we cannot live without it. For all the criticism levelled against it, nobody today in the world really has an idea how else to run the economy in the world. The second answer that capitalists give to the critics is that we just need to be a little more patient. Paradise is right around the corner. Mistakes have been made such as the Atlantic slave trade or the Great Bengal Famine, but we’ve learned our lesson from these mistakes, and if we just wait a little longer, and allow the economic pie of the world to grow bigger everybody will, in the end, receive a bigger and fatter slice of the pie. The division of the profits will never be equitable, but there will be enough to satisfy everybody in the world. There are indeed some positive signs which we can see before us, at least when we use purely material criteria such as life expectancy, child mortality and the numbers of calories that each person in the world on average receives. The standard of living of the average human being in the year 2013 is significantly higher than the standard of living of the average person 100 years ago or 500 years ago, even though, there are many more people around. This is the second answer of capitalism. Just allow the economic pie to keep growing, keep your trust in growth and everything will be okay. But the big question that now comes up is whether the economic pie can indeed grow indefinitely. Every pie needs raw materials and energy. There are many prophets of doom who warn us that sooner or later we will exhaust the raw materials and the energy sources of the planet earth. What will happen then when there is no more oil and coal and so forth to fuel the economy? This is the question for the following lesson. By Louise Taylor in History of Humankind on November 8, 2013 .
Who did ” christianity kill out of hatred”? I’m surprised you need to ask. There is a huge list. The Spanish revolution, Mary Queen of England, The Crusades -the list goes on …all killed thousands in the name of Christianity.